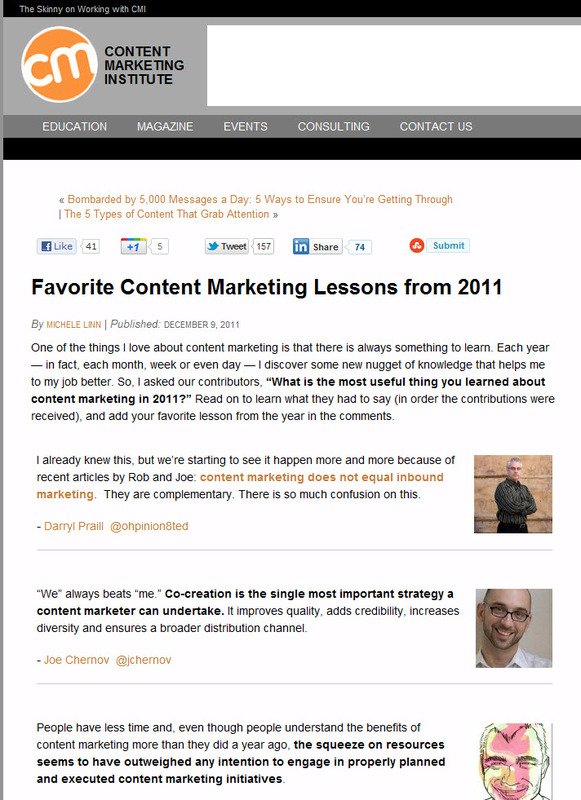 In addition tosharing Content Marketing Examples of 2011, the Content Marketing Institute asked contributors to share their Favorite Content Marketing Lessons from 2011. Joe Chernov calls attention to co-creation. Darryl Praill cautions against confusing content marketing with inbound marketing. "They are complementary," he says. John Bottom reminds us not to shortchange engaging in "properly planned and executed content marketing initiatives"
Russ Henneberry's lesson is music to my ears: "quality trumps quantity." Amanda Maksymiw says to spend time documenting "a solid strategy around your goals and target audience befor diving into any execution." Ahava Leibtag states that great strategies "are based on knowing what type of work you have to do to get to great" rather than on "predicting the future." Doug Kessler urges B2B marketers to "generate more and better content" to stand out. Scott Aughtmon reminds us that content marketing is relevant to every business and situation. Joe Pulizzi believes that companies need a content champion [aka chief content officer]. Jessica Eastman explains that content needs to be found and shared socially. Make sure it is accessible. Sarah Mitchell learned that "a team ... with diverse talents develops a better product." Jon Thomas explains that we need to listen to our audience so we understand where and how they will engage with us and focus on the right channels for our content. James Gross succinctly reminds us to be our own content consumers. Arnie Kuenn offers two sites - Soovle and Ubersuggest - to help jumpstart content marketing ideas. Heidi Cohen shares ideas on how to "extend your content marketing" to "fuel the content engine". Nate Riggs suggests that content marketers think like "radio station program directors, building editorial calendars..."
Toby Murdock urges 'quality over quantity' to find the time to spend on promoting quality content. David Huffman suggests starting small to build a convincing case for content marketing. Katie McCaskey says to focus when creating content. Nenad Senic reminds us that producing successful content is about focusing on our customers. Pam Kidner explains how important it is to make content planning and creative development part of overall marketing strategy. Heather Rast says to make "your customer's needs and interest at the center of your product/service and your communications" which ensures that your content marketing remains evergreen. Rick Allen refers to dear friends Ann Handley and CC Chapman: "reimagine content (don't recycle)". Michael Kolowich writes that "personality and attitude really do matter when it comes to content marketing". In 2011, I heard [and met] content marketer Ardath Albee discuss storytelling in business. She was mesmerizing and intensely practical in her advice about content. Content marketing needs to tell a story to engage, because Storytelling humanizes content. A story should always be told from the buyer's perspective. The beginning of the story is about the buyer, who becomes aware of a problem, and feels pain escalates. The middle of the story is about seeing resolution, encountering obstacles, and finding expertise. In the end, the buyer overcomes challenges, solves problems, and emerges as hero of the story. Which are you favorite content marketing lessons of 2011? What would you recommend that marketers do in 2012?